KALASIN: Three men arrested for the kidnapping of a woman in the Muang district of Kalasin province on Tuesday night (July 10) told police said she owed them B350,000 for drugs. The three suspects were caught following a complaint by relatives of the 26-year-old victim, whose name was not disclosed. She was rescued by Kalasin police. 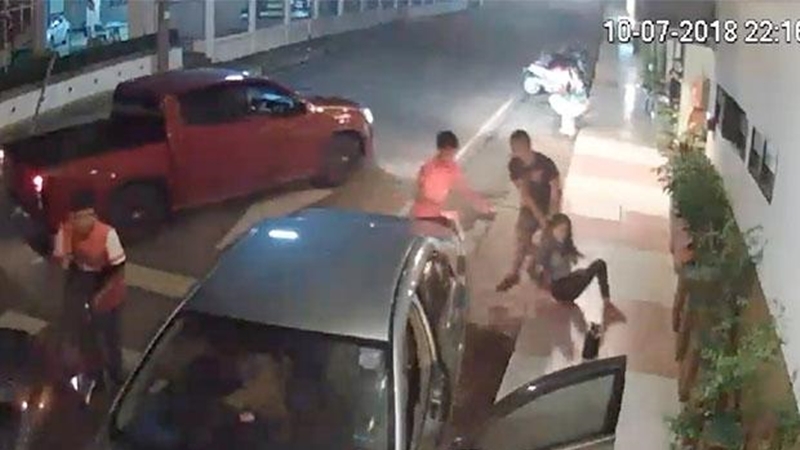 Manasak Udomphan, 23, Surasak Chanpeng, 20, and Thanarat Phuchokchai, 23, allegedly confessed they were among the five men involved in the kidnapping of the woman, which was clearly recorded by a CCTV security camera. A car carrying a group of men is seen cutting in front of a car containing the woman and two men. Two men from the first car, one carrying a knife, get out of the vehicle and move up to the vehicle. A pickup truck arrives and one man gets out. He grabs the woman by the hair and pulls her from the car, drags her into the pickup and it drives off. She was held prisoner at a deserted warehouse in Don Chan district of the northeastern province. The gang demanded B350,000 from her relatives in exchange for her freedom. The suspects told police the woman owed B350,000 for illicit drugs she had purchased. She kept postponing payment, so they finally abducted her and demanded the outstanding money as a ransom for her safe return. Col Theeraphat Thareethai, chief of Kalasin police, said today (July 12) that a manhunt was underway for the two other suspects, identified only as Sam and Mee. The hunted duo were the men in the pickup truck that took the woman to the deserted house. Court warrants had been issued for their arrest. They were believed to be in hiding in Kalasin, the provincial police chief said. Police extended the investigation after the three arrests and seized some drugs from a hotel room in nearby Maha Sarakham province where the gang had stored them. The three suspects were charged with illegal detention of the woman and having illicit drugs in their possession with intent to sell. After the woman was rescued, she and the two friends who had been in the car with her were interrogated by police. They denied involvement in illicit drugs, but were detained for further questioning. And how will you do that with the van in front of you? LOL.. buy the seconds it takes to put the car in gear and drive away, straight to the nearest police station, problem solved. Not nothing. LOL... if your owed B350,000 for drugs and you want your money, what is a locked door going to do?...nothing. It amazes me how often people don't lock their car doors, seems obvious to me.